All of our videos are available on a donation basis as far as resources allow. Please read about videos on this page, and then go to the order form to select your items and they will be shipped to you. Feel free to contact us if we can answer any questions! 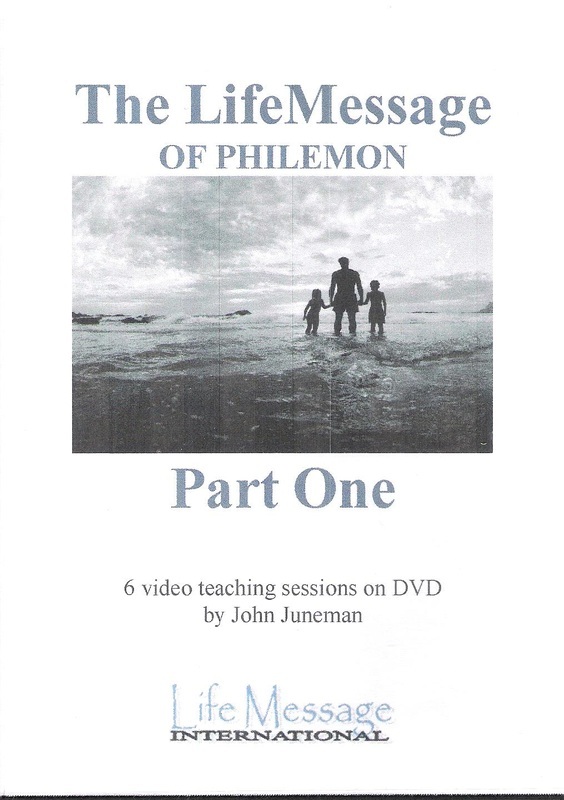 In these FIRST six 30-minute sessions (also able to be used as twelve 15-minute sessions), John Juneman begins an in-depth exploration of and immersion in Paul’s letter to Philemon. We learn in these sessions about the background and context of this letter that Paul wrote to a beloved friend in order to appeal to him to receive a runaway slave back “no longer as a slave, but as a beloved brother.” These sessions reveal the depth of affection in Paul’s heart for everyone involved and especially how that love is expressed through his life, both in word and action. It is all sourced by Jesus --- the one to whom Paul is “bound,” resulting in the refreshing and discipleship of those in his life. These life-changing truths will impact any individual or group seeking to know Jesus more and to discover how He desires to express Himself in everyday relationships. Session 3: What’s He Doing Here? In these SECOND six 30-minute sessions (also able to be used as twelve 15-minute sessions), John Juneman continues an in-depth exploration of and immersion in Paul’s letter to Philemon. We learn in these sessions about the astounding depth of relationship that Jesus produces between people who are responding to Him, and how this is a reflection of God’s plan and purpose. We see the tenderhearted connection that Paul has with both Onesimus and Philemon, and how his care for them is really the evidence of the normal activity of Jesus in the Christian life. Not only does Paul testify of how Jesus is at work in his own life, but he is inviting Philemon to also experience a new level of growth and transformation of perspective. These truths present the same invitation to any individual or group seeking to know Jesus more and to discover how He desires to express Himself in everyday relationships. In these THIRD and final six 30-minute sessions (also able to be used as twelve 15-minute sessions), John Juneman concludes an in-depth exploration of and immersion in Paul’s letter to Philemon. In these sessions we discover the surprising truth of what partnership with one another in Christ is really all about. We see how this linkage with one another became something lived out in every aspect of life among Paul and his brothers. Far from this being the exception, we find that it is the normal dynamic that Jesus produces in the lives of those responding to Him together. It is the picture of a man who is free to release his own life so that others can experience Jesus and all He wants to do in their lives. These studies are for any individual or group open to and desiring for Jesus to do the same thing among us in our day. In these verses, we find that it is more than a hope. For, Jesus is a sure thing! 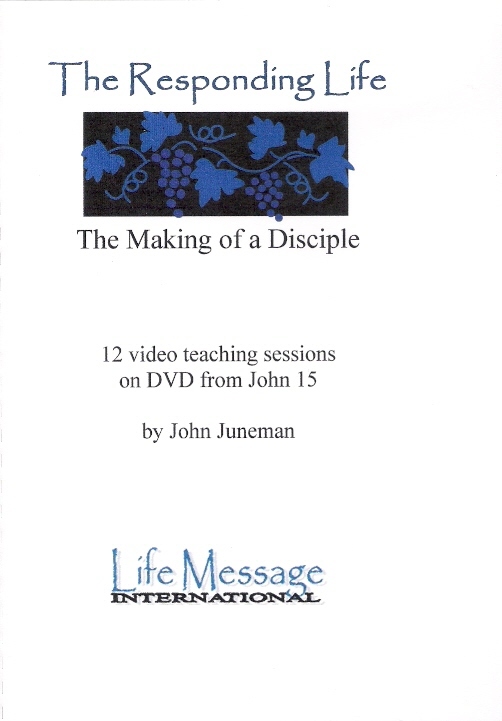 In these twelve sessions (50-60 minutes each), John Juneman explores the first part of John chapter 15 and the message of responding to Jesus. In this life-changing passage of scripture, we discover that our only function is to be a branch connected to the True Vine: Jesus Christ. As we remain in Him, and He in us, our lives bear the fruit of what He can do in us. Rather than straining to be in control of our own lives and what we can produce, we can instead experience the freedom of simply responding to Him and seeing the miracle of life being sourced by the Vine. Discover the joy of just “being” everything that God made us to be in Jesus Christ. 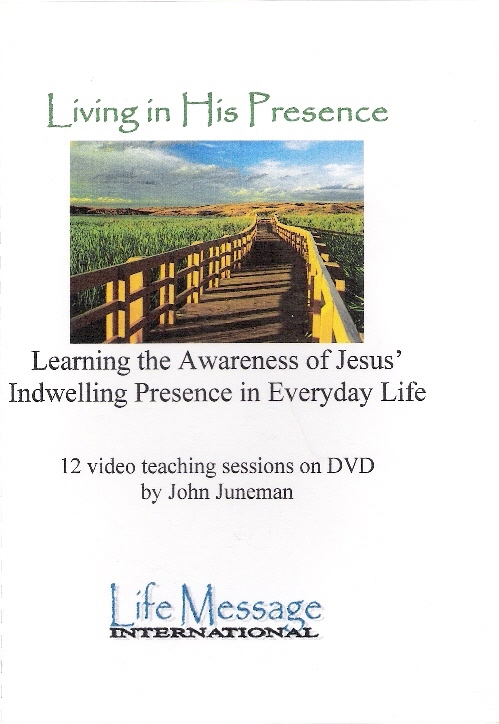 In these twelve sessions (45-50 minutes each) John Juneman explores the concept of a continuing walk with the presence of the indwelling Jesus. By investigating the Gospel of John, we learn that this was God’s design for us in relationship with Him. Instead of Christianity being a long distance relationship with a far-away God, it can be an intimate fellowship with Him in every moment and circumstance of life. As Jesus enjoyed and depended upon His Father for all things, we can have the same kind of relationship with Jesus Himself. This is the plan and provision of God for every believer! Session 2: What about Sunday? 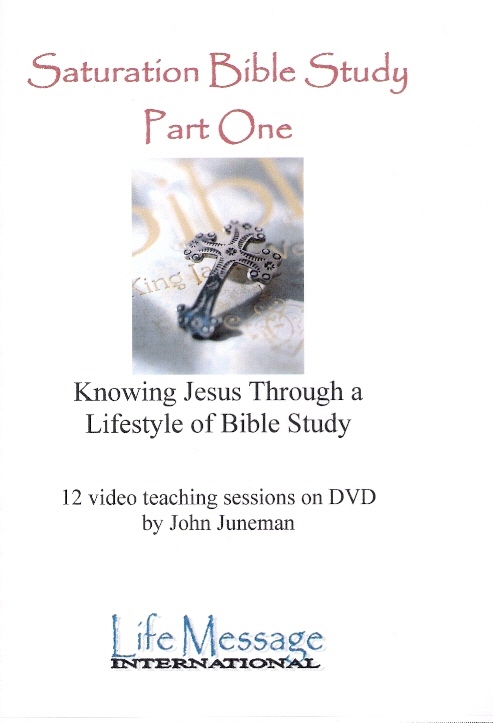 In these twelve sessions of Part One (50-60 minutes each), John Juneman goes to the heart of what bible study is about. Instead of being about a particular method, we learn that the study of the Word is really all about relationship with Jesus. This course approaches Bible study as an intense seeking and pursuit after Him by exploring some of the crucial mindsets and spiritual foundations that must be in the heart of anyone who seeks to understand the Word. In these truths we discover that Bible study is not just for a select few, but is the privilege of ANY believer who seeks to know Jesus more, regardless of his or her background. In addition to demonstrating particular tools, we will seek show how they can be helpful in specific and practical examples in Bible study. 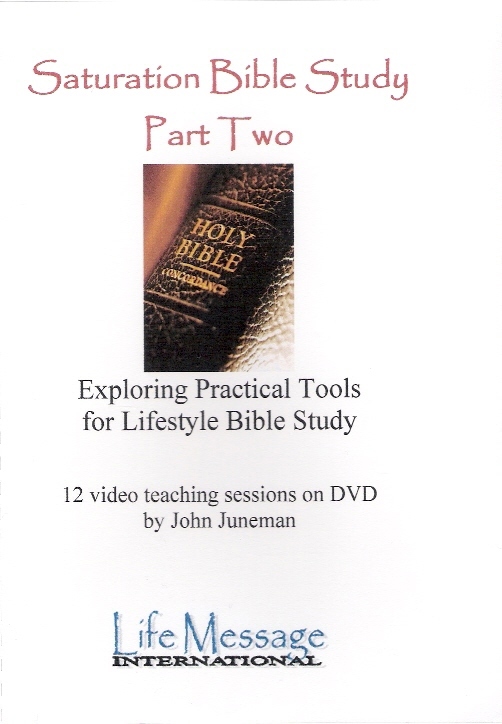 While these tools are for the more serious Bible student who has understood the concepts of Part One, we will discover in this course that these tools are truly available for anyone who has interest in going deeper in the Word. The goal is to offer a simple demonstration and model of bible study that can used by Christians of any age or background. Our prayer is that every believer will come to know Jesus more and experience a transformed life as he or she experiences the “lifestyle” of being in the Word.